Radar based sensing devices for measuring liquid level and converting it to an electrical signal to send to other instrumentation. A radar liquid level sensor is an instrument for measuring the height of a liquid and converting it to an electrical signal. 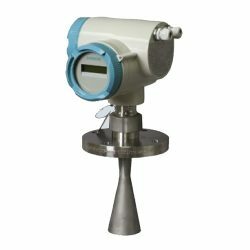 The liquid level signal output can then be utilised by other instrumentation to display, monitor, log or control the liquid level. Radar liquid level sensors are measurement devices which transmit and receive high frequency radio waves (microwaves) to measure the distance to the surface of a liquid based substance. Radar liquid level sensor technology transmits a high frequency electromagnetic wave pulse typically in the microwave spectrum, and receives the wave reflected off a liquid surface. The time taken for the microwave pulse to traverse the distance between the transmitting antenna and target surface, and back again to the receiving antenna is measured. The distance (d) between the radar liquid level sensor and the liquid surface can be calculated by dividing the time taken (t) by two, and multiplying that by the speed of light (c), i.e. d = c ∙ t / 2. The liquid level in a tank (LT) can then be determined by subtracting distance (d) from the height of the radar level sensor (HT), i.e. LT = HT – d.
Unlike ultrasonic sensors, the performance of a radar level sensor is not easily affected by temperature changes, humidity or vapour between the sensor and the liquid surface. This is because changes in air density only have a very small effect on the speed of electromagnetic waves. Also radar liquid level sensors can work in a vacuum, high pressures and high temperatures without any noticeable difference on measured transit time, so it can be used in applications where it is not possible to use ultrasonic based sensors. Due to the high frequency electromagnetic waves used, it is possible to measure distance to a very high accuracy, as long as the surface is not too close to the sensor, where the pulse transit time becomes too small to measure precisely. This is called the dead zone, blocking distance or deadband, and is typically greater than an ultrasonic based device. Since there is no contact with the fluid to be measured, radar liquid level measurement technology can be used in applications where sensors requiring contact are otherwise prohibited. These sensors have no moving parts which makes them very reliable, requiring very little maintenance. Radar liquid level sensors are typically housed in a single assembly combining the transmitter and receiver antenna in one device. The main two types of radar liquid level sensor used is through air radar (TAR) and guided wave radar (GWR). The through air radar liquid level sensor is the most commonly used type due to it being contactless and easier to install. The transmitted magnetic waves fan out from the sensor until they hit the surface of the liquid and are reflected back. The main drawback with TAR liquid level sensors is that the electromagnetic pulse energy is attenuated by greater distances and lower dielectric process media. Since there is no contact with the fluid to be measured, TAR liquid level measurement technology can be used in corrosive chemical applications. The guided wave radar type include a wave guide attached to the front of the sensor which is used to focus microwave pulse and boost the reflected wave energy. This makes it possible to use GWR type sensors with lower dielectric process media where the performance of a TAR type sensor would otherwise be degraded. Radar liquid level sensors are mounted above the surface of the liquid in the top of a tank or from a platform spanning the top of an open tank. Send us your enquiry for Radar Liquid Level Sensors to get assistance with this product type.